Sonos finally does HDMI with new Beam Soundbar, embracing ARC audio and CEC control, as well as virtually everything else (except Dolby Atmos) that's hip in A/V -- Alexa, Siri, Google Assistant, Airplay 2, Fire TV, room EQ and more. 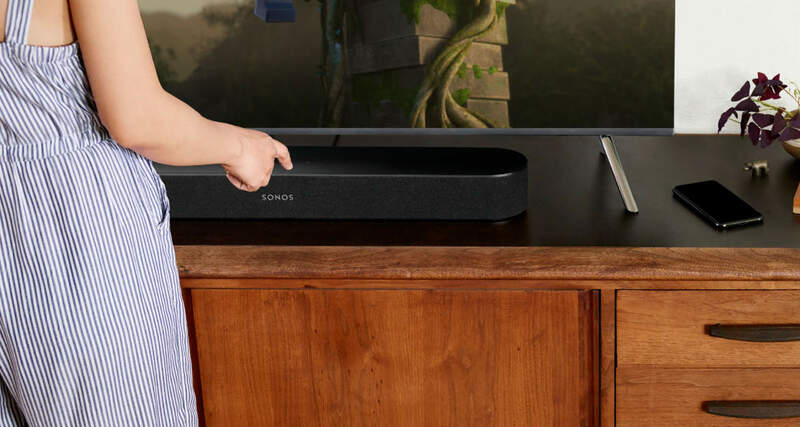 The $399 Sonos Beam soundbar is way cheaper than the original $700 Playbar, but will feature smart technologies like voice control (Alexa, Siri, Google Assistant), Apple Airplay 2, HDMI-ARC for audio and -CEC for A/V control. The new Sonos Beam may be cheaper and smaller than the company's original Playbar soundbar, but it's a whole lot smarter, with (forthcoming) support for all the big voice-control technologies -- Amazon Alexa, Google Assistant, Apple's Siri -- and virtually everything else that's cool in home A/V. It's the first Sonos product with an HDMI port, and it (eventually) will support AirPlay 2, Apple's next-gen audio streaming technology that just became available with the release of iOS11.4 this week. So far, only Apple's own HomePod packs the new technology, but Sonos will join at least five other manufacturers as early implementers of AirPlay 2. The one big no-show in Sonos Beam is support for object-oriented surround sound like Dolby Atmos. Leading up to yesterday's big Sonos press event, speculation was rampant (and hopeful) that Atmos would make it into the new product, but alas customers will have to look elsewhere for surround sound that bounces off every wall including the ceiling. Beam carries over several features from Sonos's other products, including Trueplay EQ technology, a feature that analyzes room characteristics and tailors the sound according to the room's configuration. The technology debuted in 2015 with the introduction of the Sonos Play: 5 speaker. Sonos also borrows voice-control features and a multi-microphone array from the new Sonos One Alexa-enabled speaker that launched last year (Sonos One has six mics; Beam has five). 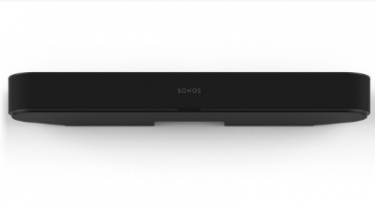 As with Sonos One, the Beam product includes multichannel echo cancellation so users can listen to music and still control the volume with their voice. Of course, the same 60+ streaming music services available to other Sonos products -- Spotify, Pandora, Google Play Music, Apple Music, TIDAL, Deezer, Amazon Music, to name a few -- also are available through Beam. "We believe we've created the best, most versatile, smart speaker in the world," said Sonos CEO Patrick Spence during yesterday's press event. "Our open approach, obsession with design, maniacal focus on quality and commitment to building a system that's easy to use and gets better over time are at the heart of everything we do." Perhaps it is Sonos's "maniacal focus" on "building a system that's easy to use" that has kept the company from embracing HDMI in the past. HDMI is notoriously finicky, with a standard that changes often, and features that may or may not be supported in any given A/V product. The connector's success often is contingent on such vagaries as the quality of the cable (Sonos includes one with Beam), the tightness of the fit, and the alignment of the stars. In both the Playbar and its cousin the Playbase, Sonos spurned HDMI in favor of an optical audio connection. Beam, on the other hand, delivers audio via the HDMI cable's audio return channel, or ARC (an optical cable adapter is included just in case). HDMI-ARC enables audio to be output to external speakers over the same cable/connector that might deliver video or control signals to the display. "We believe we've created the best, most versatile, smart speaker in the world." Sonos Beam doesn't pass video, but it does pass control signals via the HDMI CEC (consumer electronics control) standard, allowing Beam to act something like a remote control, issuing simple commands to a connected display or other HDMI device. CE Pro did not attend the Sonos event to see for ourselves, but others reported that CEC worked effectively in the demo set-up. "I’ve seen from the Beam, it works quite well for basic on / off," says a reporter from Verge. "For whatever reason, turning a TV off via a smart assistant has been hard to get right, but on the Sonos Beam, simply saying, 'Alexa, turn the TV off' worked every time." Users with an Amazon video streaming device like a Fire TV or Firestick can pair them with the Beam and use voice commands to request a specific movie or show, or play/pause a program. The Beam has a similar style to the Playbar but refreshed with a less boxy, more streamlined design. The styling hides a tweeter, four elliptical full-range woofers, and three passive radiators behind a fabric grille. The unit has just three connections: power, Ethernet, and HDMI. Sonos Beam is available in two colors, matte all-black or all-white, and its lower-profile aesthetic measures 651mm (25.6 inches) wide by 100mm (3.9 inches) deep by 68.5mm (2.6 inches) high, making it easier to place in front of a TV display without blocking IR signals. Beam will cost $399 in the US, £399 in the UK, and €449 in Europe, and will be available for purchase on July 17. We shall see if the product becomes publicly available before Sonos stock does. The company was expected to launch an IPO, valued at about $3 billion, this month.